Running has truly gone mainstream – viral even! Good luck to my friend Jeric as he attempts to trounce Mr. Zeddie Little of New York! While browsing through my old, sappy LJ, I stumbled upon the following entry. It was about our intensely competitive campus runs in the high school team. The title isn’t a reference to the Zach Effron movie! Back in high school, I was especially fond of our afternoon campus runs early in the season. Minutes before the bell, I’ve already packed all my school stuff and readied my training gear. Since all of us were guys (some gay. hahaha), the bell ringing was a signal for me to take off my pants and sweaty polo to change into my athletic gear. Those were innocent times. I always ran with the distance runners in the team, the fastest when it comes to these endurance runs, of course, to push myself to the limit. Our route for those campus runs was no joke. 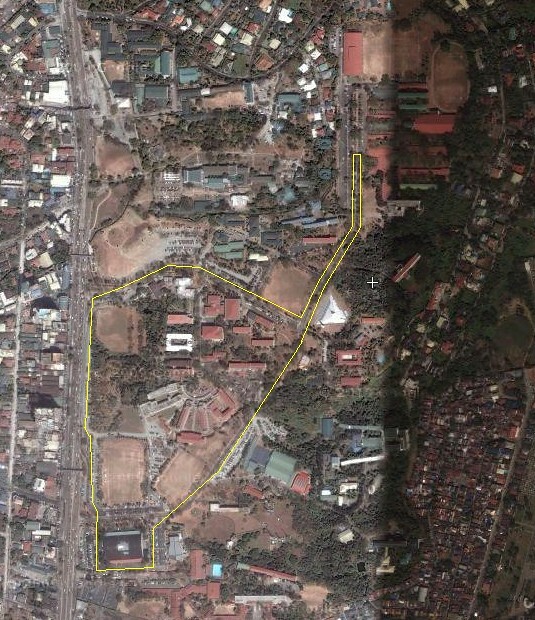 The first few weeks of training consisted of one lap campus runs that started from the high school admin building, around the Blue Eagle Gym and back to the admin. As the training progresses, we doubled the number of laps. The guys in the lead pack would usually start the final sprint back to the admin (the homestretch) in front of the driveway leading to the Jesuit Residence. There was one instance when some of my teammates and I started the final dash a good 100m earlier than usual (in front of Cervini and Berchmans). My legs were like turbocharged pistons as I ran at full throttle. I can feel my well-worn Nike running shoes make contact with the harsh pavement with each full stride. Soon enough, the painful sensation of lactic acid buildup started to set in. The fact that I had to be wary of cars (it was dismissal time) and pedestrians didn’t help my running at all. As we passed the Jesuit Residence driveway, I was on the verge of simply giving up. The tempation was a strong one, but I simply couldn’t relent. I was leading the entire team, our top distance runner included, stopping was out of the question. My speed increased even more as I ran downhill into the homestretch. I could’ve ran like hell to the so-called finish line but for some reason, I slowed down and allowed my former team captain to take the lead. Yesterday afternoon, I found out that Coach had given Ian permission to run. I was aghast! We weren’t supposed to go back to training until the 11th! It was unfair so I borrowed a pair of shorts from one of my teammates. We were in for a surprise when Coach made us run with the distance runners. As I toiled and willed myself to finish that 15 lap ordeal, the entire experience reminded me of my high school days and our campus runs. As usual, I ran alongside the fastest and ran magnificently. Running without a care in the world, in those borrowed basketball shorts, made me feel like I was 17 again. I’m quite choosy when it comes to my running environs. Running around our subdivision is an option. But for some reason, I just can’t get into the zone when working out near my home (home equates to a place of rest!) I tried running at the nearby U.P. campus a few years back. The surroundings of the State University just felt alien. The only place I can stand doing long runs (being the sprint hurdler that I am!) 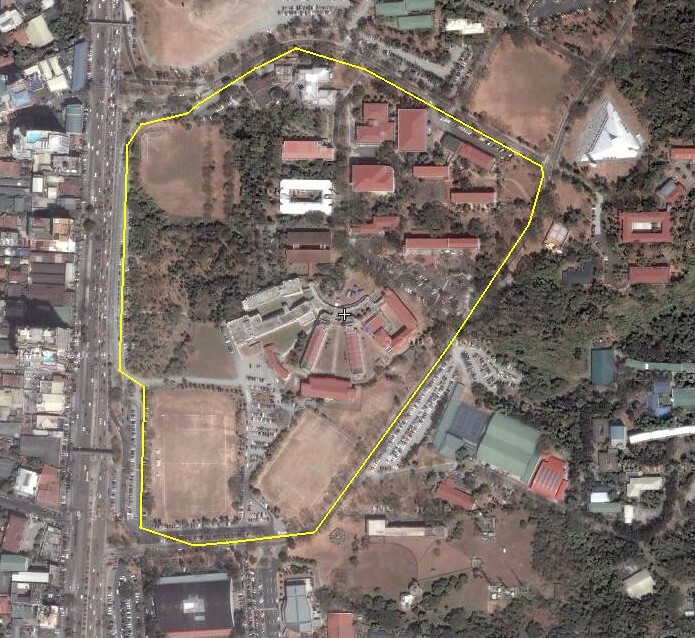 is at the good ole Ateneo campus. 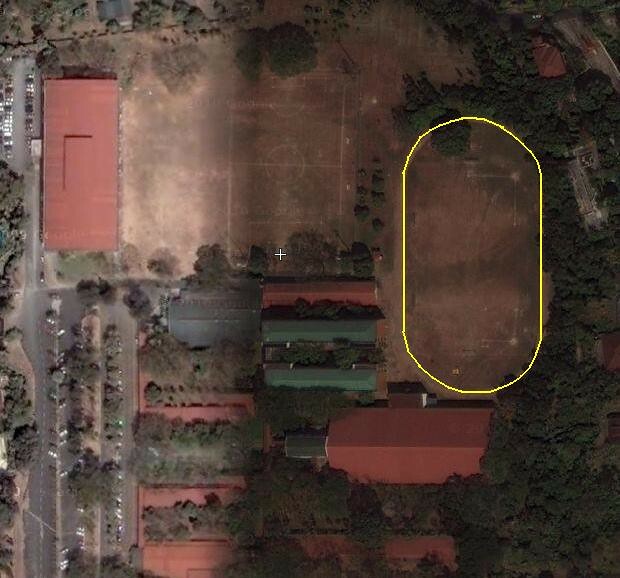 I built the foundations of my athletics background on that quiet hill in Loyola. I’ve grown accustomed to its familiar sights and sounds. I practically know every nook and cranny of the place. Back in my sophomore year in high school (2000), I couldn’t even run 200m without getting a side stitch during those dreaded fitness tests in P.E. class. Everything changed for the better when I started playing basketball. My body toughened up because of the hoops game. Just like any other wide-eyed high school kid, I had dreams of making it big on the court (the UAAP and the PBA!) To build my stamina, I began to ran laps around the high school grass track. From two laps (800m) at the start, I gained enough strength to last 5 to 6 laps (2km to 2.4km) in a few months’ time. During basketball summer camp, I was exposed to longer distances. 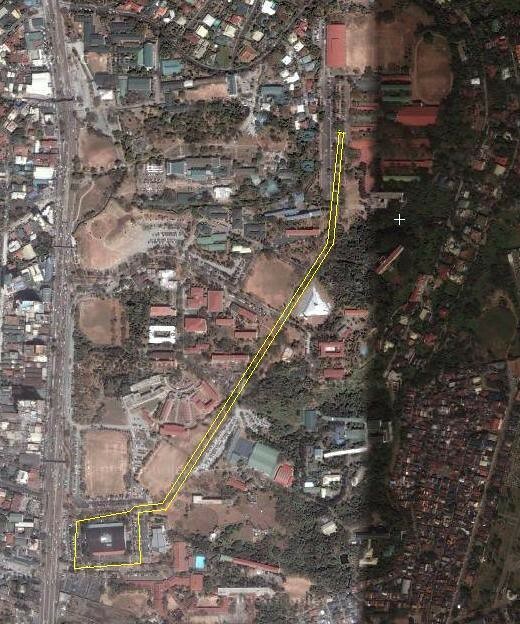 For my then 15-year old body, the 6.8km-long “Road Work” course was an excruciating trudge. My best time for the distance was around 35 to 36 minutes. Surprisingly, I performed with distinction during those lung-busting workouts. My basketball coaches even asked if I was a member of the track team (those were the earliest suggestions of a potential track career!). At that time, of course, I was about half a year away from my first-ever track & field meet in 2001. I have no intention of running 6.8km again in the near future! After getting cut off from the basketball team, I tried out for Coach Ed Sediego’s champion track & field squad. I was exposed to a different, more enjoyable brand of training. I was especially fond of our campus runs at the start of the season. We usually did 1 lap of 2.5km during the first weeks and progressed to 2 laps (a total of 5km) in the next two weeks. 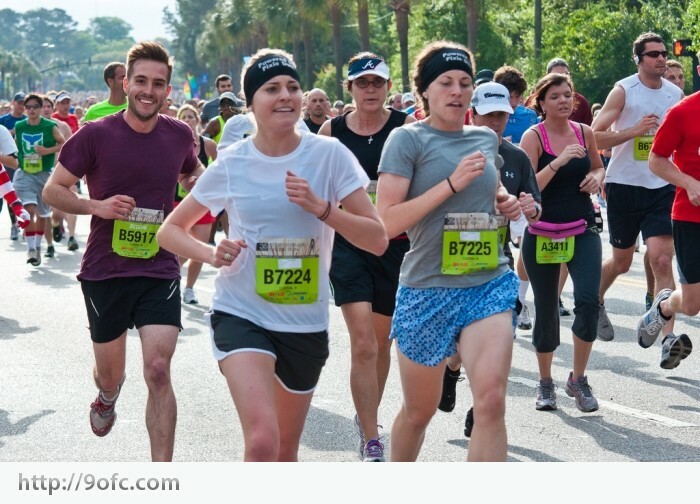 My teammates and I would usually pace ourselves the entire way, gradually jostling for position as the finish line came. At the home stretch, all hell broke lose as around 15 to 20 youngsters sprinted all out to the high school administration building! 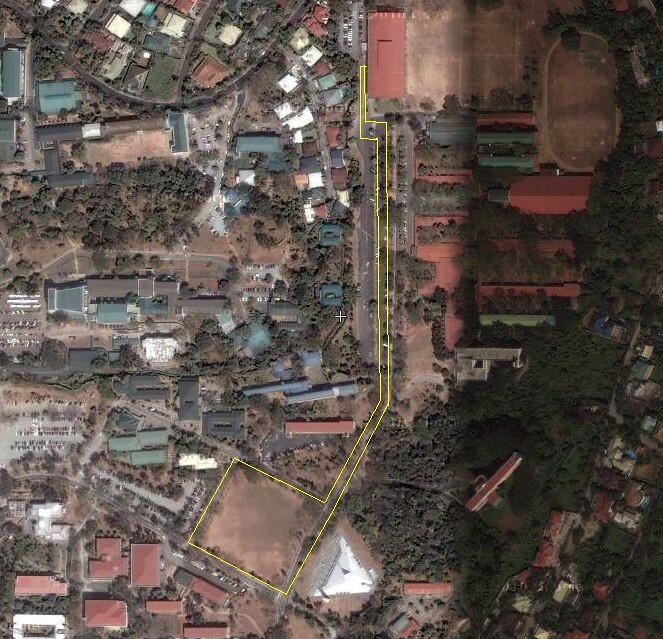 I still followed the same route in college, opting to vary it a little bit by circling the college campus (2.9 km). At the times when I found Moro’s indoor track too stifling, I ran outdoors for my pre-workout warm-up routine, running a relaxed 1 to 1.5km run – depending on the type of training I’m about to do. I also followed the same route – more or less – for my evening cool down runs. Looking back, it has been a decade since I started running. The experience has been worthwhile. I don’t see myself stopping any time soon. Note: Thank you to the Scientist Runner’s superb screenshots of various running trails from the world over. Those posts inspired me to write this entry. I was a high school junior when I first saw Rio dela Cruz compete. I cannot remember the medals that he won or the actual event that he ran in, but I still clearly hear how passionately his teammates from UP cheered him on. And they had tons to cheer for, since Rio was at the top echelons of the UAAP seniors division. The shouts of “Go Rio!” were infectious. Soon enough, my teammates and I were cheering along with our competitors from UP. Fast forward almost a decade later, Rio is now at the pinnacle of the running boom. With his posters and billboards (with the likes of Piolo Pascual and Donna Cruz!) strewn all around the Metro, he is now a celebrity (read his life story). While training in Moro back in 2007, I chanced upon the nascent Coach Rio diligently teaching the rudiments of running to a youngster. Three years later, he’s training hundreds of runners at a time in Ultra and organizing long runs almost every week for thousands of people! What a guy. 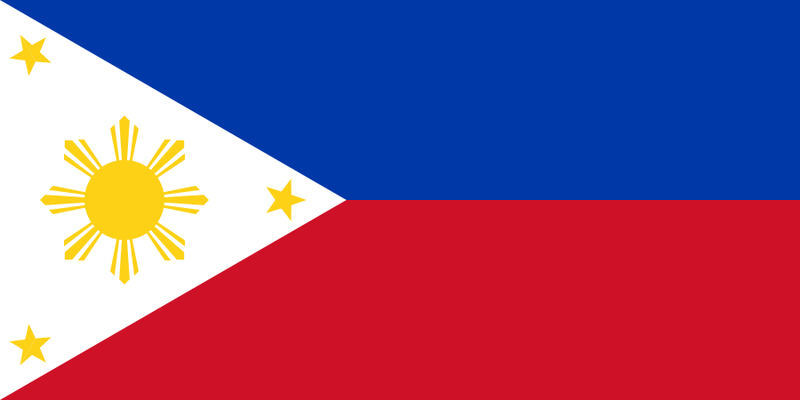 Coach Rio’s popularity is good for Philippine Track & Field – if the public interest in recreational running trickles down to athletics itself. Being too young to remember the heyday of Lydia de Vega, I often wonder if Rio is an even bigger celebrity than Asia’s former Sprint Queen. I bumped into Rio during last week’s National Open. We talked a bit about his busy schedule and some of his upcoming projects. I wish him the best of luck. I’m happy that us track & field guys finally has a legitimate poster boy – a model at that!